We are excited and ready to play in the Whittier Area Community Church League. Praise the Lord!!! 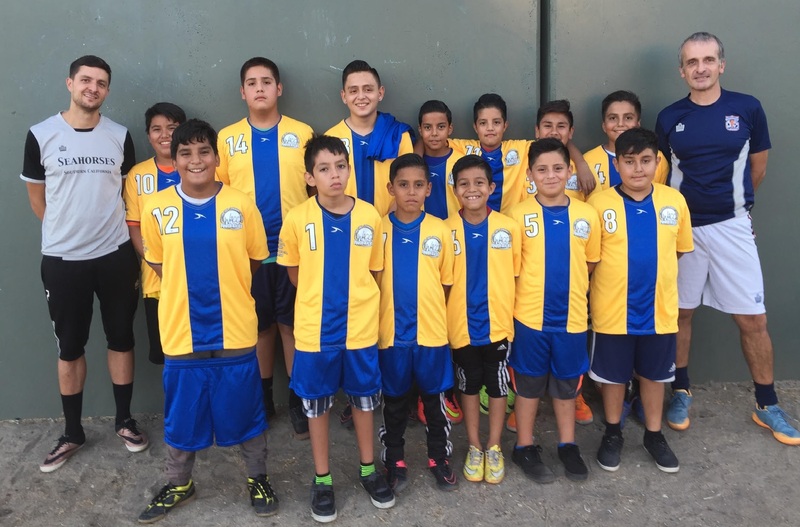 After several months of street soccer games and weekly trainings we were able to find a good group of boys who are committed to the game, to some essential rules and most of all to each other. We train under the lights one night per week and play games in the weekend. The group is a big mix of 3-9th graders, but they are all like brothers in arms, fighting the good fight, growing as individuals and as a team. Prayers and sharing times at the beginning and end of our meetings help our bonding and growth. This entry was posted in Ministry Update and tagged Urban Outreach. Sometimes blessings come in disguise. Me losing my job at the end of spring was just like that. I was at home the entire summer while school was out. 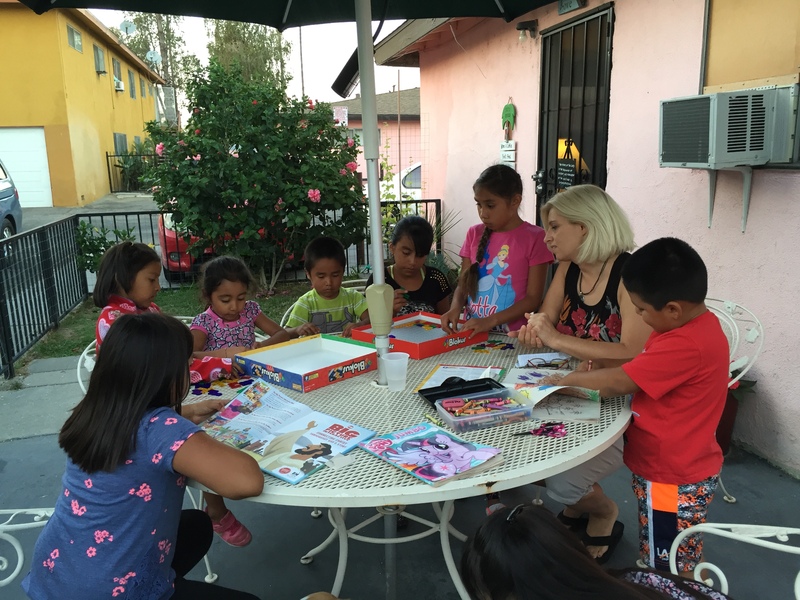 Our patio became a permanent place of a free and unstructured “VBS” with a “curriculum” written by the Holy Spirit. Kids of all ages showed up at any and all time of the day and evening in smaller or larger groups and got their share of ice cold water, fruit, crafts, Veggie Tales, games, Bible stories, and Bible games on the iPad. I discovered that in the rare occasion when I had the chance to have one-on-one time with them they just couldn’t get enough of the individual attention. I realized that they might be really missing that from their lives. Most of these kids don’t even have their own beds. They grow up sharing a bed with their siblings and the room with their entire family. For us that is strange. For them that is a natural part of their culture. Yet, I can’t help but feel like I need to “help to raise them out of it”. …Is that the right thing to do? …I’m not sure at all. I just know one thing: teaching them about the love of Christ is good. Coloring, drawing and crafts are always popular. Of course chasing the dogs is also fun. We had SOOO many kids on our patio this afternoon that even though I had somewhere else to be I couldn’t leave Csaba here alone with them. Even the two of us were not really enough to satisfy all their need for attention. 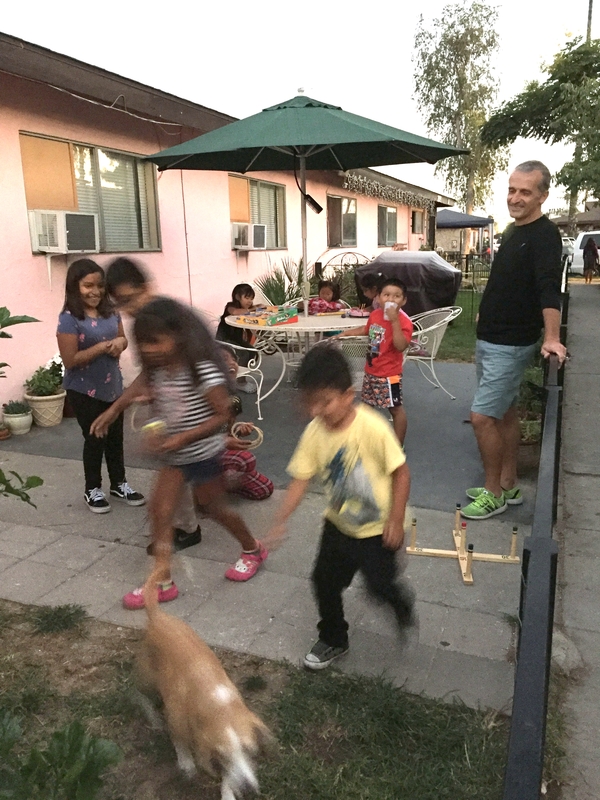 We played cards, we played connect four, challenged their brains for hours with a new toy where they built channels for marbles – used to be one of our kids most favorite game – and watched 5 helicopters circling over our heads, guessing together what we will see on the news. They just left. Everything is dirty, sticky and we both are totally worn out but God is good. We were able to talk to them about J. O. Y. (Jesus first, Others second and You last). We taught them not to break off the heads of the flowers bc the bees make honey out of the pollen (hence the sticky mess of honey tasting), took them apart when they were fighting and took them off the top of the parking cars when they started chasing each other. 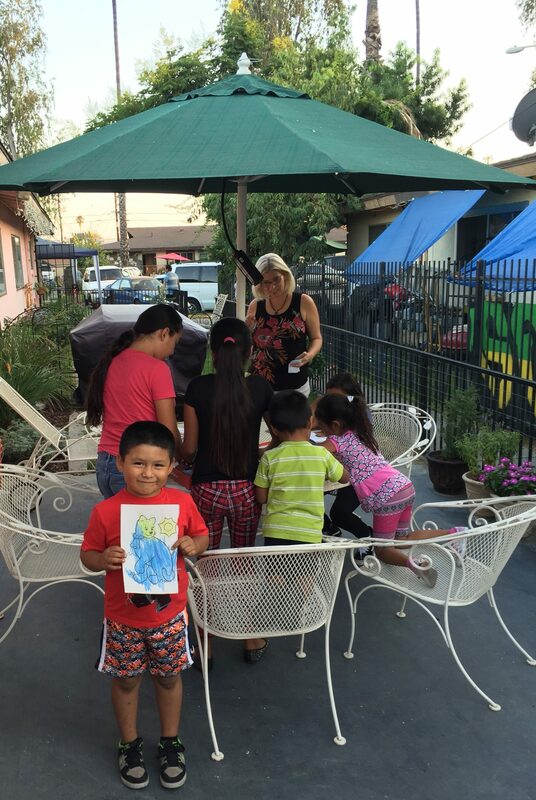 It was just another afternoon on our patio when the Lord blessed us with an opportunity to show His love to them. First night of Urban Seahorses indoor soccer!!! We had 17 kids and they had a great time. We are so grateful for the opportunity to train in the elementary school gym for 6 weeks. After 45 minutes intensive training we had a short devotional and then played 5 v 5 games for the rest of the evening. Futsal on the floor is fast and the rules were new for some of them, but they are good and learn quickly.